Holborough Anchorians v New Ash Green - Away, Skipper J Nash (1-15) won the toss, inserted the opposition and lead the way starting his 10 over spell with a wicket maiden 1st over of the match. A run-out from the hands of K Poole had the opposition in trouble at 3-2 in the 5th over. The rest of the bowling attack took the hint: M Sumner opening with Nash took 3 for 8 in his 10 over spell; and follow-on bowlers A Gleeson (3-13) & N Delaffon (2-7) despatched the rest within a further 8.3 overs. D Freeman & P Webb added to their catches tally. New Ash Green heading into the pavilion feeling confident about chasing down a mere 46 runs. After tea New Ash Green made the most of a low target to give virtually all of the team a go at the crease. D Freeman took ownership at No 3 scoring 24 not out, as New Ash Green accumulated the runs required in 16.2 overs finishing up 49-7. New Ash Green v Dulwich VI - At home, also winning the coin flip and inserting the opposition, Skipper G Freeman also had a side in form to work with. F Quantrill opening set the standard first ball, with G Jones taking the catch. He finished out his 7 over spell 5 for 12. M Gallagher (1-7), M Ives (1-5), J Clark (1-14) & a run-out from the skipper accounted for the remaining wickets. G Jones ending up with 3 catches, one each to S Freeman & M Ives. The opposition headed in for tea all out for 85 in 30.2 overs. After tea, G Jones failed this week at jug avoidance, poor counting leaving him looking a little bemused at the boundary-side applause when a six followed by a four took him to 51. And with the next ball the oppostion bowler took his revenge, the catch and Jones' wicket. The next over allowed fellow opener G Freemen (28*) to knock off the remaining runs required, finishing the match with a four. President's XI v Chairman's XI - Unfortunately, the rain set in early, so the match was cancelled, but nonetheless, New Ash Green gathered at the pavilion to celebrate the previous day's victories for the two sides, eat some lunch and enjoy Ted's quiz before the stragglers moved on for a curry to round out the day. 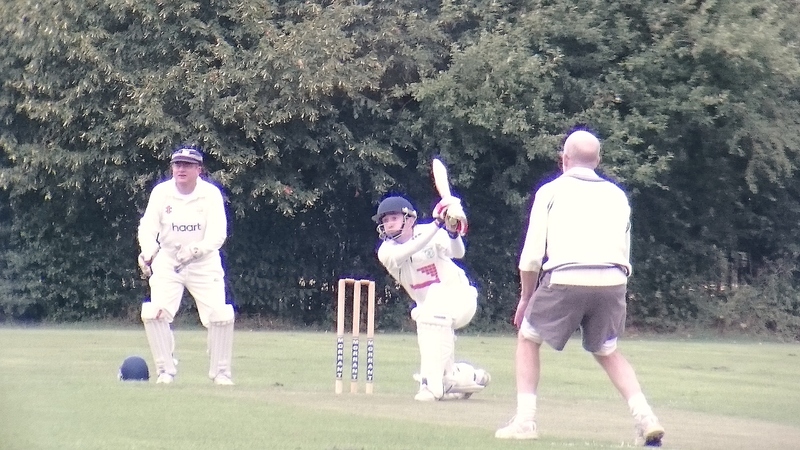 Bowling attack - Gareth Jones hitting out. For more club photos check out our gallery & also our instagram.